We spent the week of the 4th of July in Texas again this year. Our first few days were spent in Leakey with the Rodriguez family. We shot fireworks on the 4th. Jackson and Mitchell helped with the display. They both had a blast and only got minor injuries. Really they both just got sparked enough to learn to be careful. 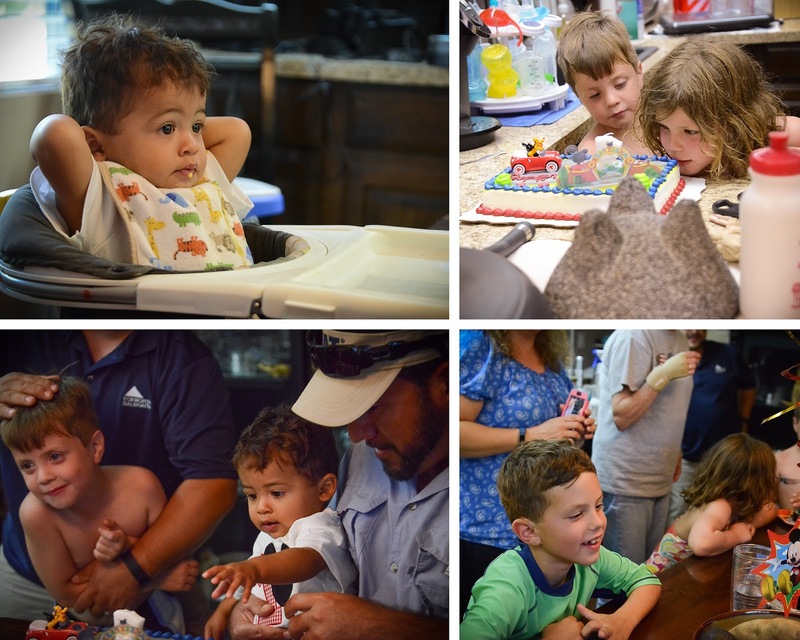 We also floated the Frio river, played on the ranch, and celebrated Taylor's first birthday! Everyone was excited. I enjoyed watching Audrey drink in the smell of the cake, Mitchell help his little brother blow out his candles, and Jackson grin from ear to ear watching his baby cousin investigate cake for the first time. 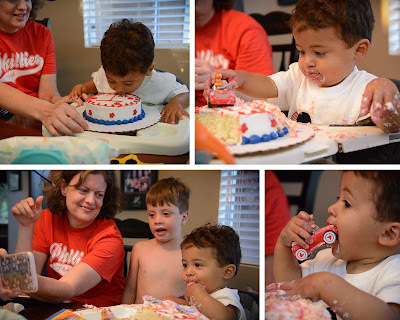 It didn't take long for Taylor to dig into the cake and enjoy driving Mickey around on the icing while singing the hot dog song. 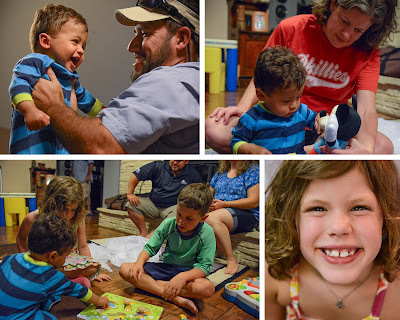 Taylor loved his presents and playing with family. There were lots of giggles and laughter, especially when Mickey did his songs and dances. 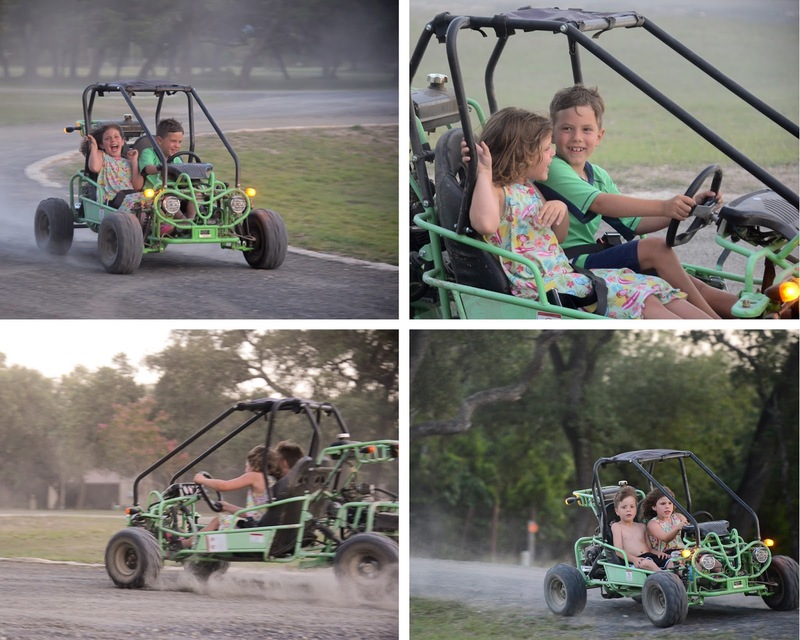 If that wasn't enough fun, both kids became go-kart drivers while we were there. Not something that was easy for me to watch! Mitchell taught them to drive...he can't reach the brake, which means they only know one speed, fast. Audrey almost crashed once, and when we had her stop so we could talk to her about how to be safe, we pointed out that she almost crashed. Her response was, "But I didn't!" We all couldn't keep ourselves from laughing since she said it with a huge grin on her face. Watch out world when this one gets her license! 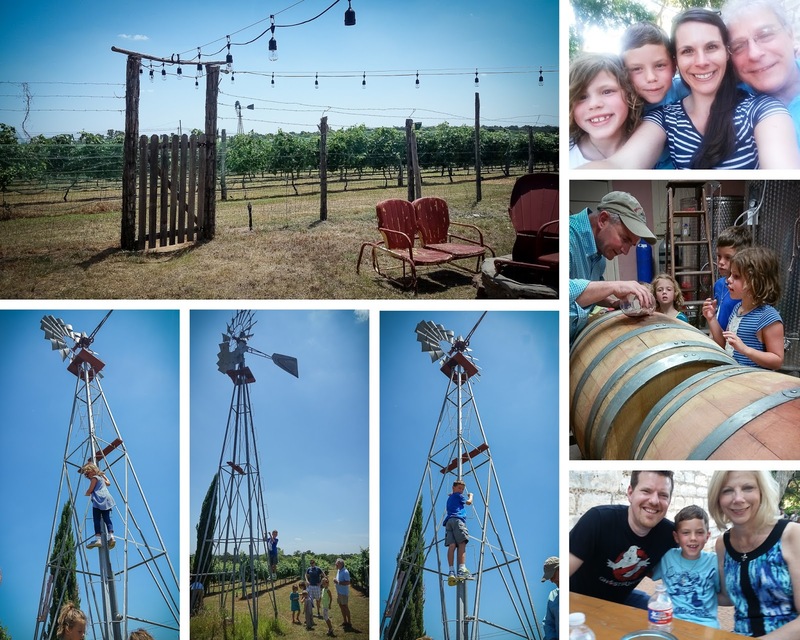 We spent the remainder of the week in Fredericksburg with my Dad and the Money family. We went swimming and checked out the local farmers market and their vineyard. The kids loved playing together, and we had a wonderful time visiting and helping out however we could. We wrapped up our visit to Texas with a visit to one of our all-time favorite restaurants in Austin, Trudy's. It was even better than we remembered! Great way to end a great week!